Many of you reading this short article already know that hemoglobin A1C is extremely useful revealing what the "average" blood sugar has been over the previous ninety days. This is the same standard laboratory measurement used to measure blood sugar control in diabetics. 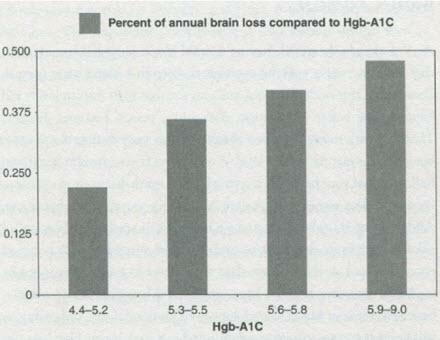 What many people may not be aware of is the fact that hemoglobin A1C has important implications for your brain health. In a landmark study published in the journal Neurology, the researchers documented that elevated hemoglobin A1C is associated with changes in brain size. The study showed researchers looking at MRIs to determine which lab test correlated best with brain atrophy and found that the hemoglobin A1C demonstrated the most powerful relationship. They commented, “when comparing the degree of brain tissue loss in those individuals with the lowest hemoglobin A1C (4.4 to 5.2) to those having the highest hemoglobin A1C (5.9 to 9.0), the brain loss in those individuals with the highest hemoglobin A1C was almost doubled during a six-year period. This profound study strongly indicates that hemoglobin A1C is far more than just a marker of blood sugar balance. The good news is in most cases you have absolute control over your A1C. An ideal hemoglobin A1C would be in the 4.8 to 5.4 range. Keep in mind that reducing carbohydrate ingestion, weight loss, and physical exercise will ultimately improve insulin sensitivity and lead to a reduction of hemoglobin A1C. C. Enzinger, et al., "Risk Factors for Progression of Brain Atrophy in Aging: Six-year Follow-up of Normal Subjects," Neurology 64, no. 10 (May 24, 2005): 1704-11.